Simushir is a deserted, 5-mile-wide volcanic island in the Kuril Islands chain, half way between northern Japan and the Kamchatka Peninsula of Russia. Four volcanoes—Milne, Prevo, Urataman, and Zavaritski—have built cones tall enough to rise above the green forest. The remaining remnant of Zavaritski Volcano is a caldera, formed when a volcano collapses into its emptied magma chamber. A small lake fills the innermost of three nested calderas that make up Zavaritski Caldera. The larger caldera of Urataman Volcano is connected to the sea. 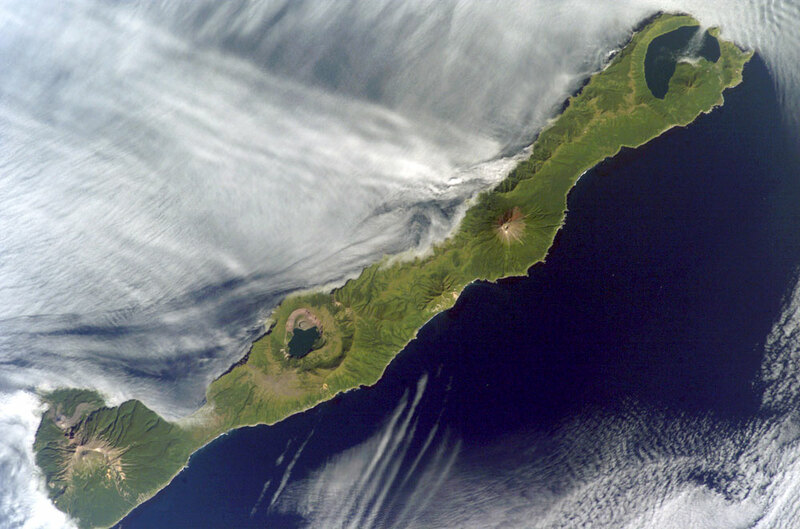 The islands and volcanoes of the Kuril chain are part of the Pacific “Ring of Fire,” marking the edge of the Pacific tectonic plate. 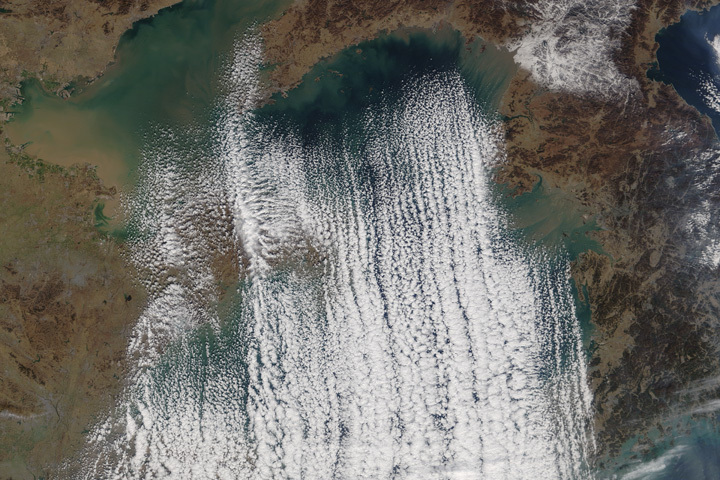 Low stratus clouds approaching from the northwest (from the Sea of Okhotsk) bank against the northwest side of the island, forming complex cloud patterns. 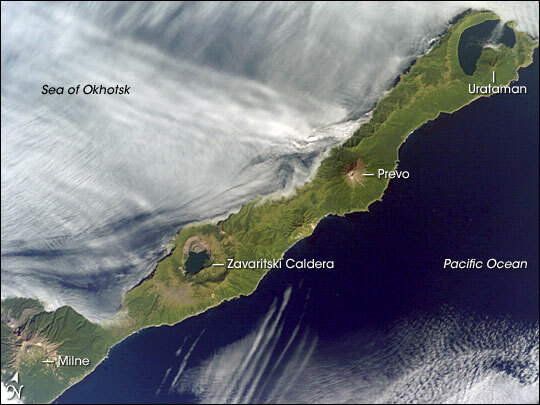 A small finger of cloud enters the northernmost caldera (Urataman) at sea level. When this image was taken, the cloud layer had stopped at the island’s northwest coast, not flowing over even the low points between the volcanoes. The cloud pattern suggests that an air mass flowed up and over the island, descending on the southeast side. 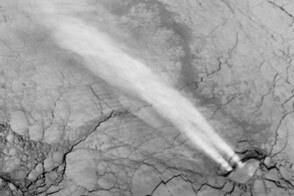 When air rises, it often cools; water vapor in the air condenses into cloud droplets. When air sinks, it often warms, causing cloud droplets to evaporate. It appears that in this situation, the descending motion of the air warmed the atmosphere enough so that a cloud-free zone formed on the southeastern, lee side, of the island. Astronaut photograph ISS015-E-26171 was acquired on September 1, 2007, with a Kodak 760C digital camera using an 180 mm lens. 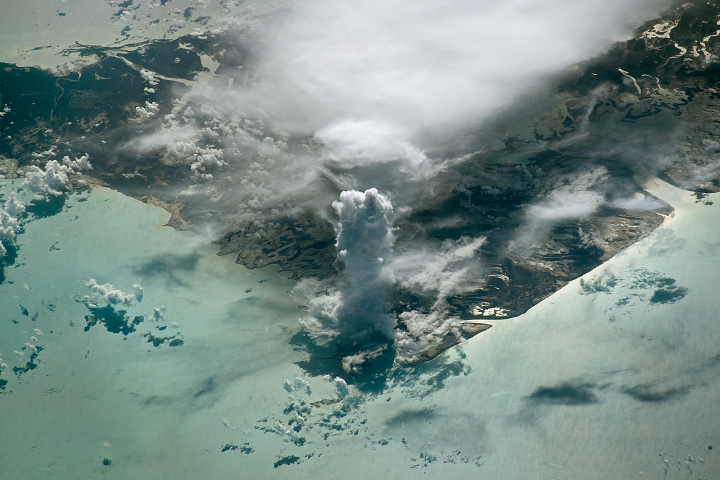 The image was taken by the Expedition 15 crew, and it is provided by the ISS Crew Earth Observations Experiment and Image Science & Analysis Laboratory, Johnson Space Center. The image in this article has been cropped and enhanced to improve contrast. The International Space Station Program supports the laboratory to help astronauts take pictures of Earth that will be of the greatest value to scientists and the public, and to make those images freely available on the Internet. Additional images taken by astronauts and cosmonauts can be viewed at the NASA/JSC Gateway to Astronaut Photography of Earth. Simushir is a deserted, 5-mile-wide volcanic island in the Kuril Islands chain, half way between northern Japan and the Kamchatka Peninsula of Russia. Four volcanoes—Milne, Prevo, Urataman, and Zavaritski—have built cones tall enough to rise above the green forest. The remaining remnant of Zavaritski Volcano is a caldera, formed when a volcano collapses into its emptied magma chamber.